Amanda Stowers demonstrates her passive morning wing design for a flapping robot, which is able to bend, much like a bird’s wing. A new robotic wing, inspired by those of birds and bats, recovers from midair collisions with a simple mechanism: a pin joint that allows it to bend. Birds and bats maneuver through forests easily and recover from collisions with branches because their wings fold upon impact, then unfold. An artificial wing “beats back and forth, but it doesn’t fold,” said David Lentink, a mechanical engineer at Stanford University. 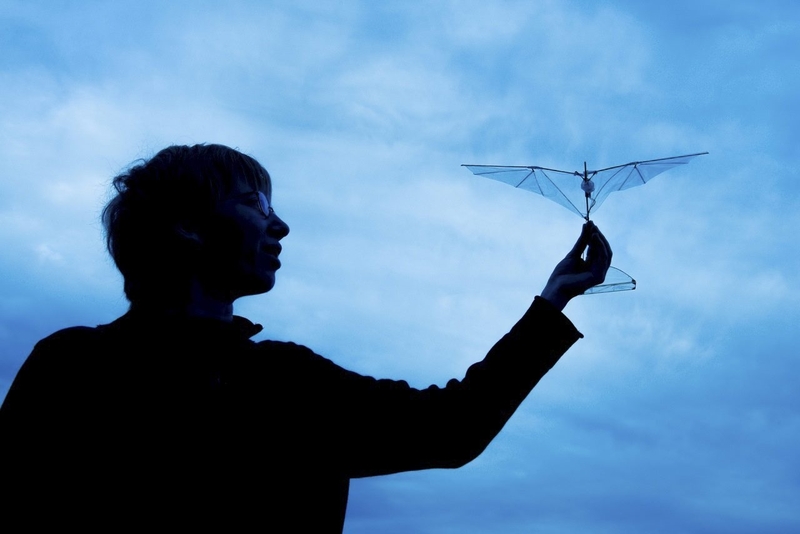 Using a 3-D printer, the researchers designed a joint that connects part of the wing nearest to the body to the part farthest away, much like a real bird’s. He and his colleagues described the robot wing in a study published in the journal Bioinspiration and Biomimetics. His graduate student and co-author, Amanda Stowers, tested the wing by hitting it with a steel rod. With every blow, the wing bent and then re-extended itself. Based on mathematical calculations, the researchers say the design should work well regardless of the wing’s size. Much like human farmers, fungus-farming ants meticulously maintain their subterranean gardens. They regularly fertilize, weed and tend to their crops. Now, researchers have discovered that one primitive species cultivates a kind of fungus that is entirely domesticated. “These ants make their living by being farmers, and they are absolutely dependent on this fungus,” said Ted Schultz, an entomologist at the Smithsonian Institution. He and his colleagues will describe their findings in a coming issue of the American Naturalist. Apterostigma megacephala was first described in 1999, based on four specimens found in Peru and Colombia. Ten years later, researchers discovered its nests in the eastern Amazon region of Brazil and realized that the ants cultivate a type of fungus that grows only in its nests and those of a species of leaf-cutter ants. The fungus, Leucoagaricus gongylophorus, evolved only 2 million to 8 million years ago. DNA sequencing shows that the ant belongs to an ancient lineage that dates back 39 million years. How and when the species got hold of the fungus remains a mystery, Schultz said. Other primitive fungus-farming ants cannot digest the fungus without dying, Schultz said.